Candy Lacquer Fluttershy, Mentality Euphoria, KB Shimmer Watercolor and Amy's Nail Boutique My Two Cents. You can click on the names to see swatches of these polishes or bottle shots. The rules are simple. Use the rafflecopter below to enter. You have until January 31, 2013 to enter. International followers are welcome. If you are not happy with the polish, get over it....It's FREE!!! You should be happy with all of them though. They are pretty amazing. Oh, and thanks for following. I read and value every comment. I don't have time to respond but don't think that is because I don't care because I love to read the comments. I always answer questions though. Pretty and polished is my favorite so far! Jindie Nails is my favorite! I love Whimsical Ideas by Pam and Emily de Molly! I haven't try most to compare, but so far from what I see, I do like Cindy from Shimmer Polish. I really like the style of her creations. Pretty and Polished is the only one I own, but I love it! Sonoma is my FAV! I love everything she creates! I think it's a toss up between Different Dimension and LynBDesigns at the moment! Congrats on 700 followers and thank you for such an awesome giveaway! First off, THANK YOU for the giveaway!!! so far my fav is Darling Diva's.. but i only have 1 indie :) lol. I love Whimsical Ideas by Pam. My favorite indie polish creator so far is Pretty and Polished! I have several favorites, but TIED for first is Pretty and Polished and Femme Fatale Lacquer! I just recently got into the world of indie polish but so far my favorite indies are: darling diva polish, daring digits polish and jindie nails. I don't really own any others. It's hard to pick just one, but my favourites are Jindie Nails, Pretty & Polished, and Smitten Polish :) Thanks for the giveaway! I'm new to polishes, so I'm just starting to see indie polishes. I've just recently stopped biting my nails (bit them my entire life) and I've found keeping them pretty and polished is really helping to keep them out of my mouth. Well, other than myself (FLash Your Tips!) I like DOllish Polish and Chirality! I love them all! But if I had to chose, JindieNails is my favorite! I have never owned a indie polish but the KB Shimmer Watercolor looks really pretty. I'm IN LOVE with Lush Lacquer and Darling Diva's lines. 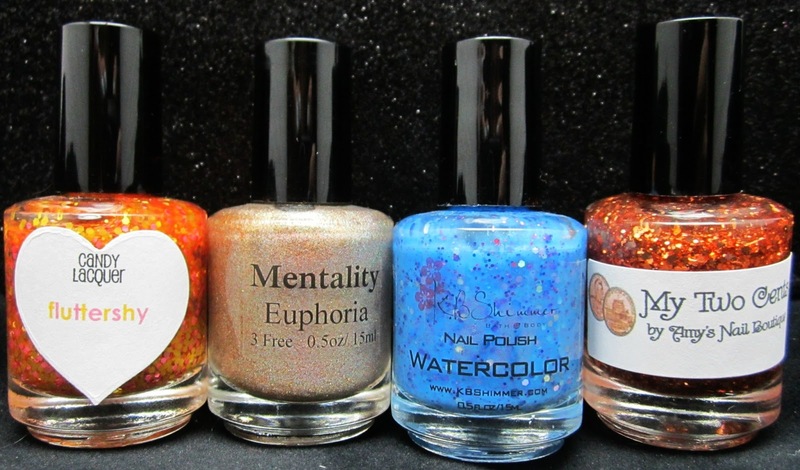 Wonderful, wonderful polishes! Pahlish, because it's the only indie I own. I really don't think I can narrow it down. I think it x designer and then next day it is x designer and then the following week it changes to x designer. Sigh. I don't own any indies yet. I know I'm such a looser lol. There's so may pretty ones I can't really decide. It all started with Lynnderella for me and I have to say, her polishes are the ones I reach for the most! That's a hard question!! At this exact moment, I would say Pretty and Polished! This is a great giveaway! I love KB Shimmer! I ordered my first indie polish from laquerheadpolish I'm excited for it to get here!!! I haven't tried that many Indies yet.. but I really love the Wing Dust Collections polishes I have. I haven't tried any yet - there's so many I don't know where to start! I have only modest experience with indies and based on that experience, my favourite indie polishes are from NailsIT. But from what I've seen on other blogs, Enchanted polish would certainly be my favourite one if I could get my hands on some. It's a pleasure reading you, I've just discovered your blog and started browsing through your posts, you are very talented! I don't really have a favorite indie polish brand since I haven't tried them, but Lynderella's polishes look insanely beautiful! From what I've tried I liked Pretty and Polished. I don't own any indie polishes yet, but I've seen a lot of NailsIT swatches and they look amazing. This is such a hard question... My top five are KBShimmer, Whimsical Ideas by Pam, Pahlish, Jindie Nails, and Girly Bits! My favorite Indie makers are Nailgasm and Lucky 13! I love a-england nail polish and I'de love to try more! I don't own any yet. I'm new to all of this. I don't have any, but they all seem so pretty! I only have a few indies, but one of my favorites is by Naild' It! Above the curve is the first one ive been able to acquire! Probably KBShimmer, though I love a lot of them! SO HARD! Pretty and Polished I think! I don't have any indie polishes yet. :( I do love all the unique swatches I've seen though. I recently swatched Darling Diva and I fell in love. My favorite indy polishmaker is Anni of Vivid Lacquer. My fav is KB Shimmer! But there are so many indies out there that I love :) Thanks for the giveaway! I would say my favorite is Enchanted Polish with KB Shimmer being my 2nd fave. I don't own very many indies. I think I own 4? So out of what I do have I have to say that I love love love Cult Nails!! Its a mix between Mentality (I own 5, yay giveaway! ), and Lucky 13 Lacquer which I hope to get a few! I'd say Glitzology since I have more of hers than any others. ooooh so exciting! I love that there is an indie world of nail polish - so cool and creative! My favorite is Darling Diva polish. I really like Lucky 13 Lacquers. It's a toss-up between Girly Bits and Red Carpet! I think this is a really good idea!! I don't have indie polishes because the shipping costs to Spain are usually too expensive so this is a very good way to know indies for those who can't have easy access to this kind of polish. I forgot to tell you that my favourite Indie Polish creator is KBShimmer, even I don't own any of their polishes I think they look amazing!!! It's so hard to pick just one, but I'd say Whimsical by Pam! I dont have a fav yet I am new to indie polishes. Would love to try some tho. Thanks for the contest. I love all indie polishes !! I am a big fan or Lynbdesigns, daring digits, nailgasm, square hue, hare and jindie omg i know i forgot a few !! Thanks for the giveaway ! I'm new to the world of indies, but so gar, I'm loving Lucky 13. I will say I LOVE Whimsical by Pam, Smitten, Tough as Nails Lacquer and Too Cute-Icle! They're all super awesome! Right now I'd have to say my favorite indie polish maker is Cameo Colours Lacquers. She comes up with some great stuff! As a whole, Crows Toes is my fave...but my absolute favorite bottle of indie polish is Glitter Daze Reloaded! I've never owned an indie polish before. I can't say that I've tried enough indies yet to have a favorite. Always looking to try more! To be honest, I don't know, which is why this is a great opportunity! My favorite is KB Shimmer Watercolor! Thank you so much for the giveaway! My favorite of the ones I own is Chirality CU2+, but I don't own many indies yet. Whimsical Ideas is my favorite! I really like Hit Polish and Different Dimension. Thanks for the nice giveaway! I don't own any indie polishes. But I do like the Darling diva polish looks. I do not currently own indie polishes. This is an awesome giveaway. All of the polishes are so nice! I don't own any indies but I've been lusting for some by Daily Lacquer! I love Windestine, the first indie polishe I ever saw. The first time I saw swatches of Snow Prince, it took my breath away and opened my eyes to a world full of creativity. KBshimmer! thanks for the great giveaway. KbShimmer is my favorite indie polish maker!